Like magic? Like tattooing? Like werewolves? Like feisty magical tattoo artist fighting off a charming rogue werewolf suitor with a stick, while the two of them might just be prey to a serial killer targeting the magically tattooed? 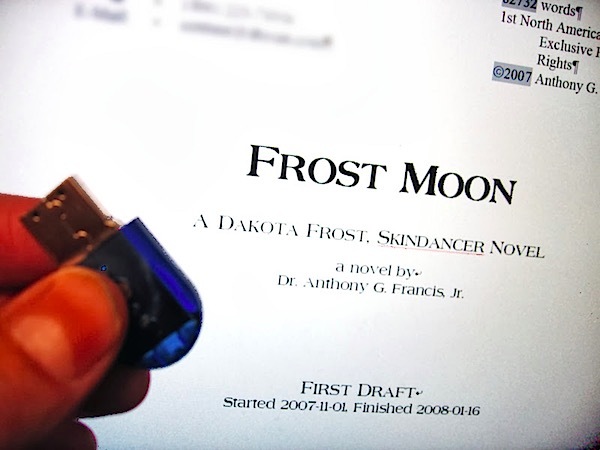 Well, if so, you are in luck, because the first book in the Dakota Frost, Skindancer series, FROST MOON, is now on sale on Amazon! I’m hard at work at Book 4, SPECTRAL IRON, and Book 5, PHANTOM SILVER, and even a spinoff series starring Dakota Frost’s adoptive daughter, Cinnamon Frost, starting with the book provisionally titled HEX CODE. So if you read these, I plan on having a lot more where that was coming from! I hope you enjoy!